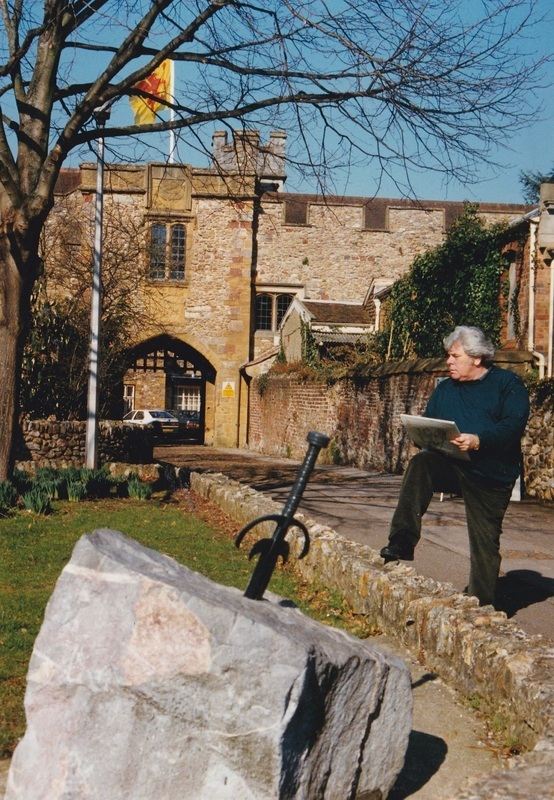 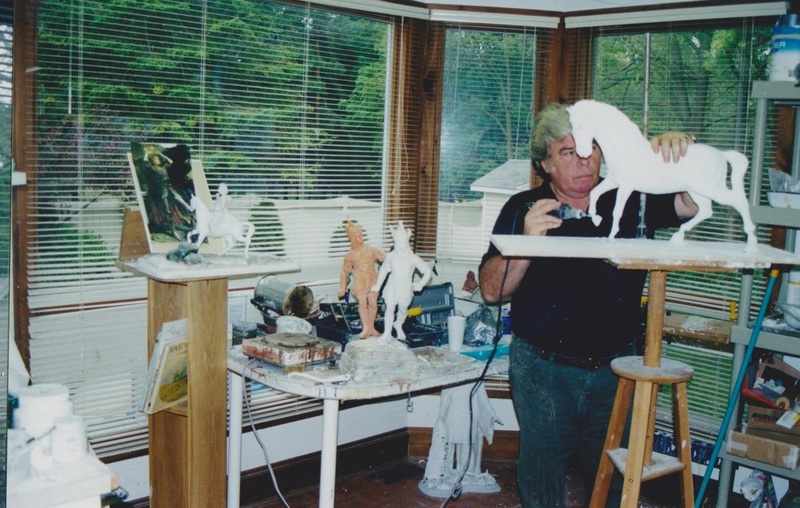 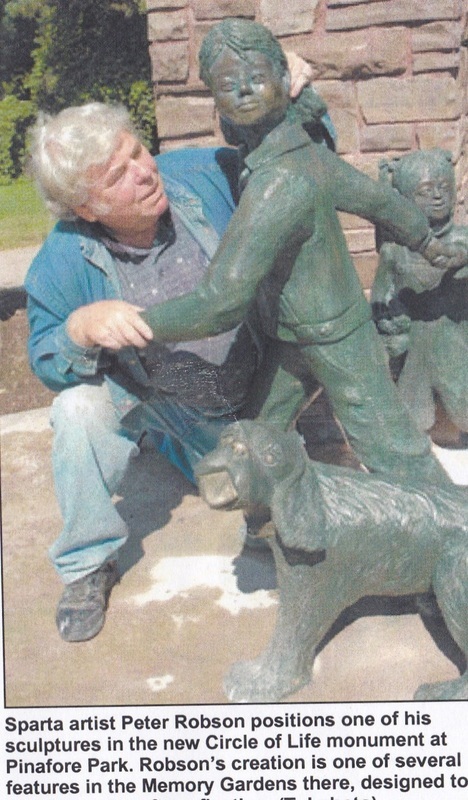 We take great pride in displaying the sculpture works of Peter Robson. 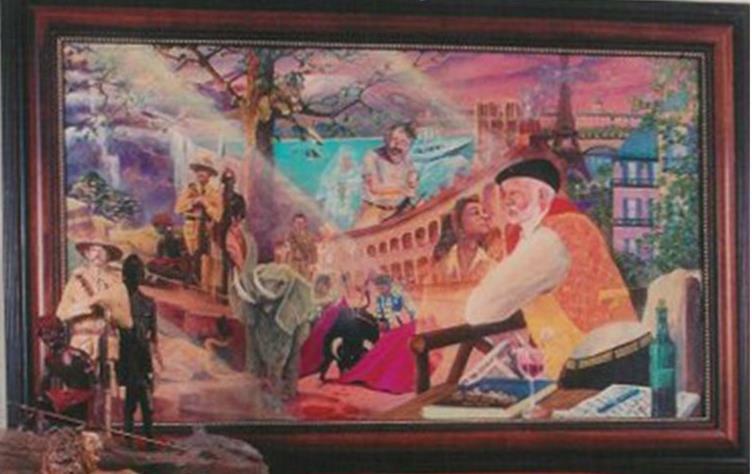 In some cases there is also a painting or giclee print that accompanies the sculpture. 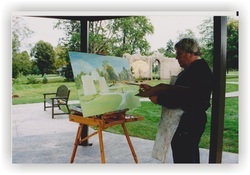 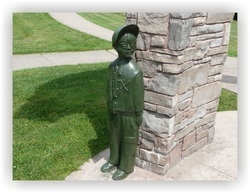 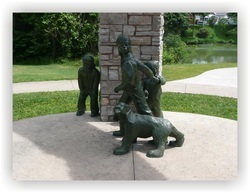 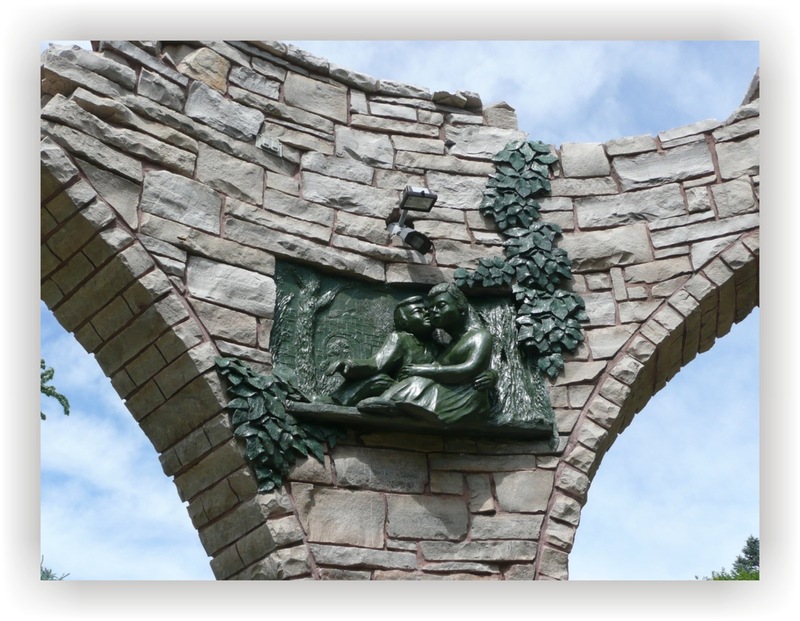 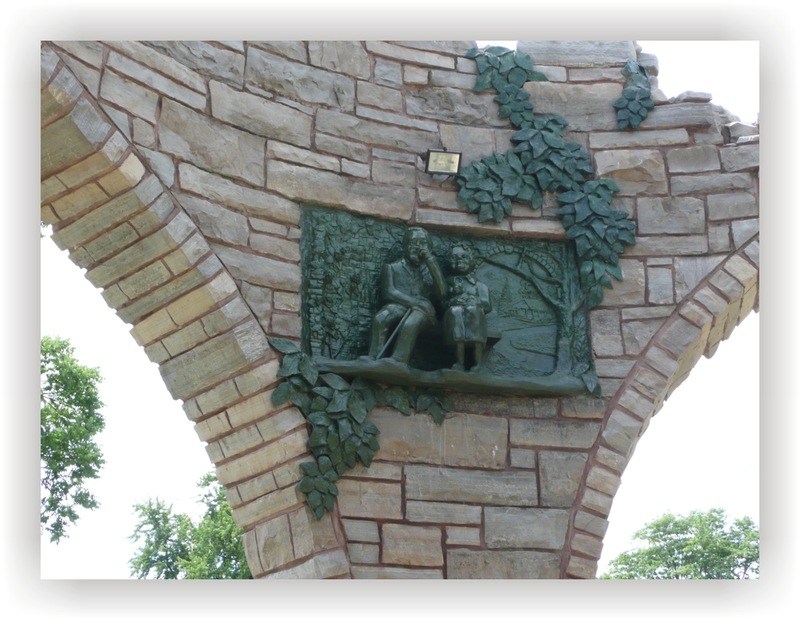 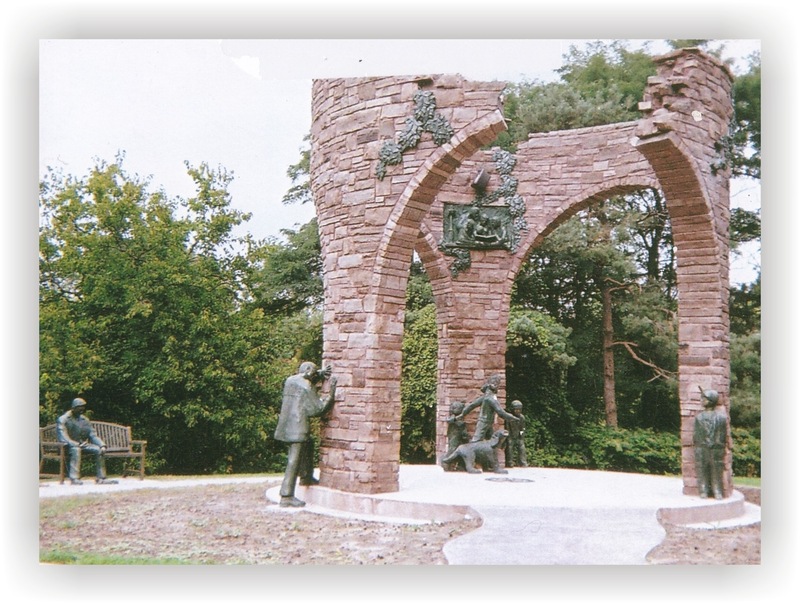 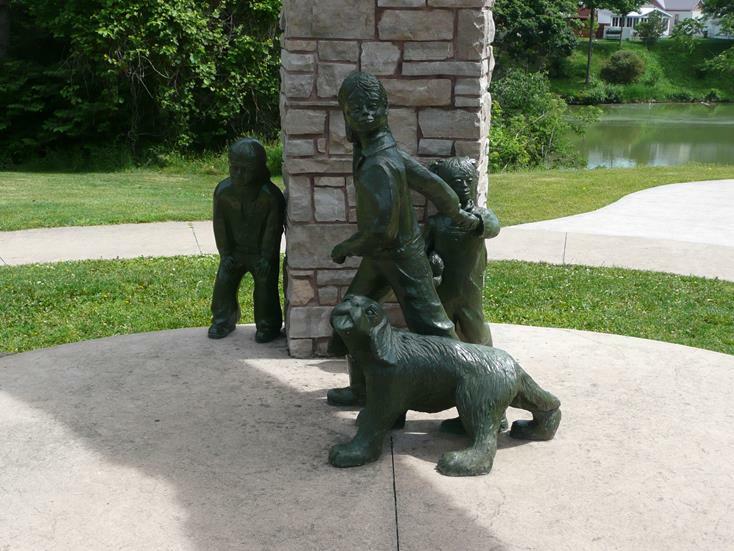 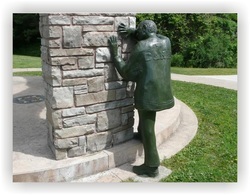 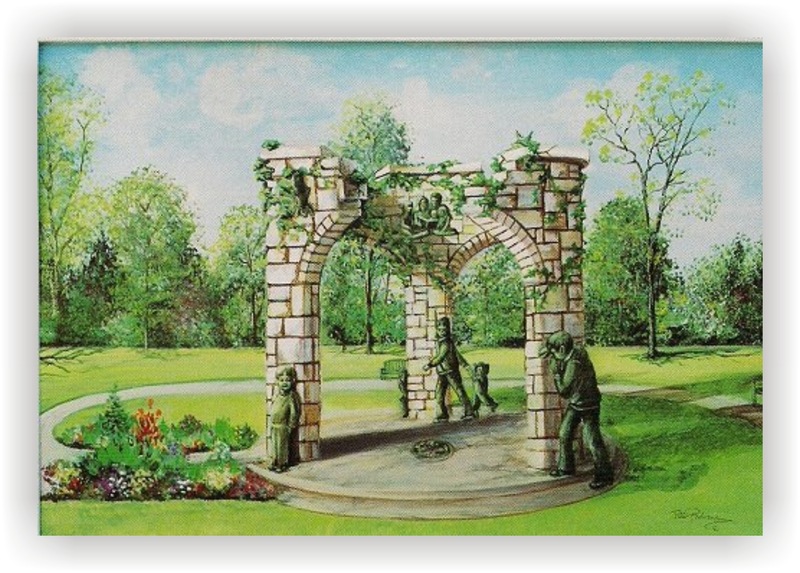 One of Peter's endeavers, some would say his crowning sculptural achievement, involves the CIRCLE OF LIFE sculptures for the Memory Garden of Pinafore Park in St. Thomas, Ontario. 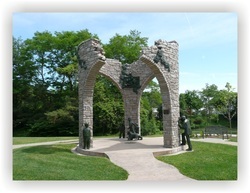 The "CIRCLE OF LIFE" is a life-size sculpture consisting of three stone columns rising to a central point, forming arches. 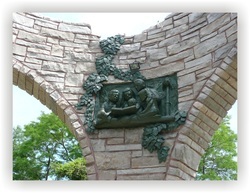 Throughout the structure are bronze figures depicting children playing hide and seek and relief sculptures on the interior of a young couple, a family with children and an elderly couple, completing the Circle of Life. 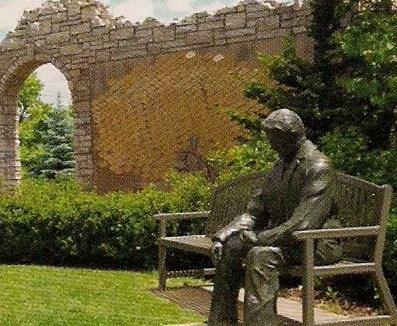 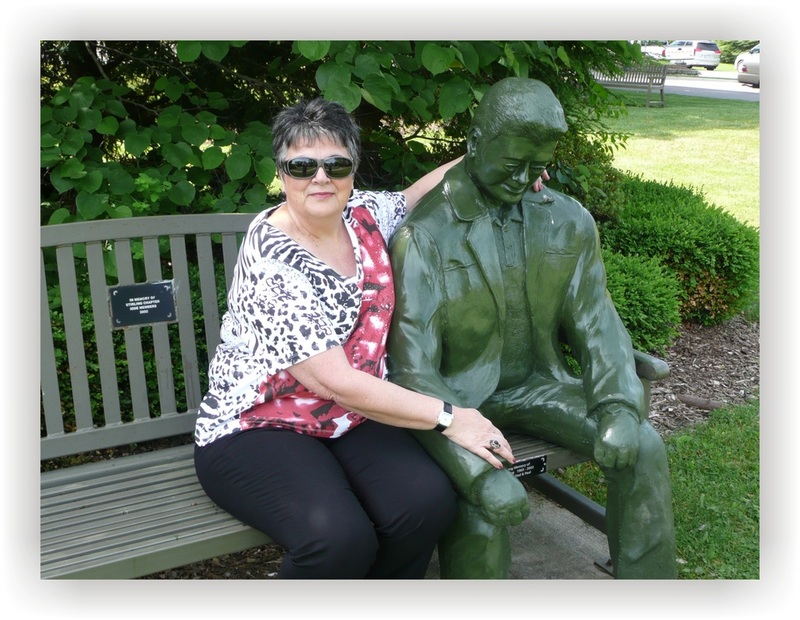 Sitting adjacent is the life size figure of "Matt" Mailing contemplating the Memory Garden sculpture. 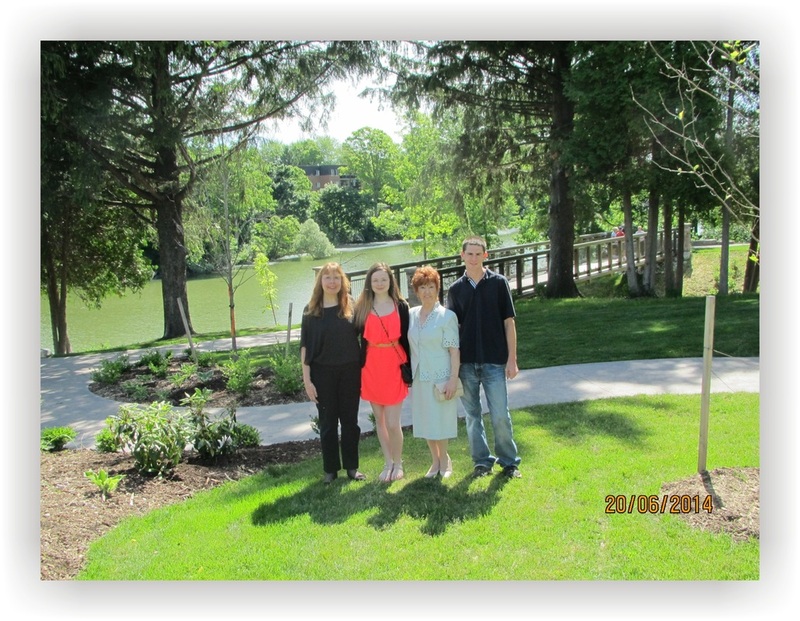 MEMORY GARDEN OFFICIAL OPENING - Pinafore Park, St. Thomas, Ont. 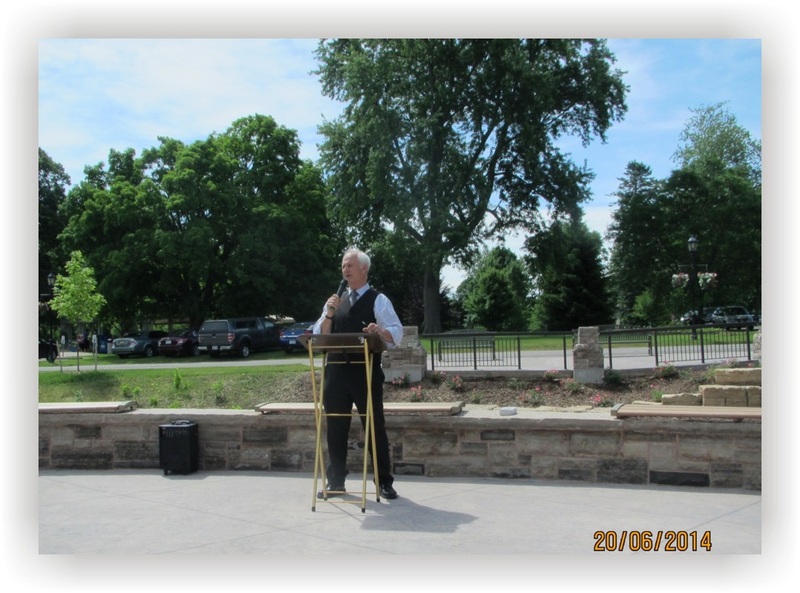 In June, 2014 the Memory Garden was at last ready be officially opened, and it was a lovely occasion. 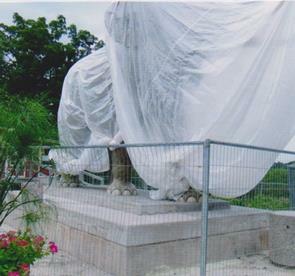 It is indeed a wonderful tribute to the hard work and dedication of so many people and completed the original vision for this section of the Park which commenced with the Circle of Life sculptures unveiled in 2005. 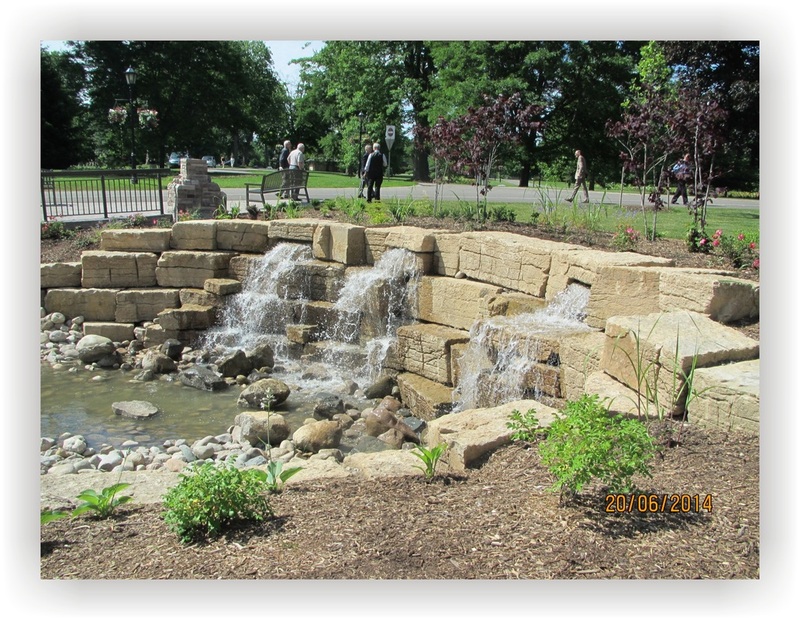 Many people, alongside local officials, were present to witness the ceremonial opening of this area of the park, which encompasses beautiful flower gardens, winding walkways, and the magnificent waterfall which cascades under the glass enclosed bridge on its way to the pond. 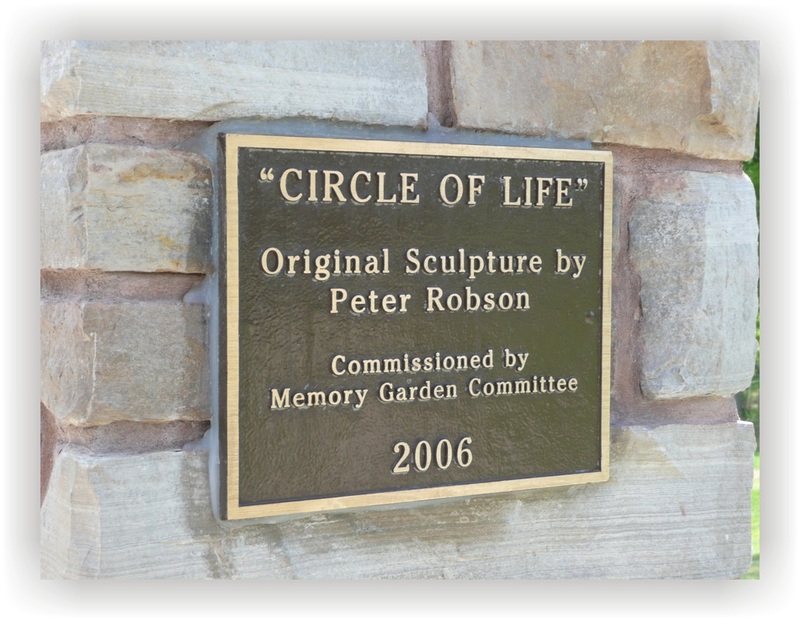 Eleanor was honoured to deliver a speech on Peter's behalf which outlined the history of the creation of the Circle of Life sculptures and identify the various figures contained within it. 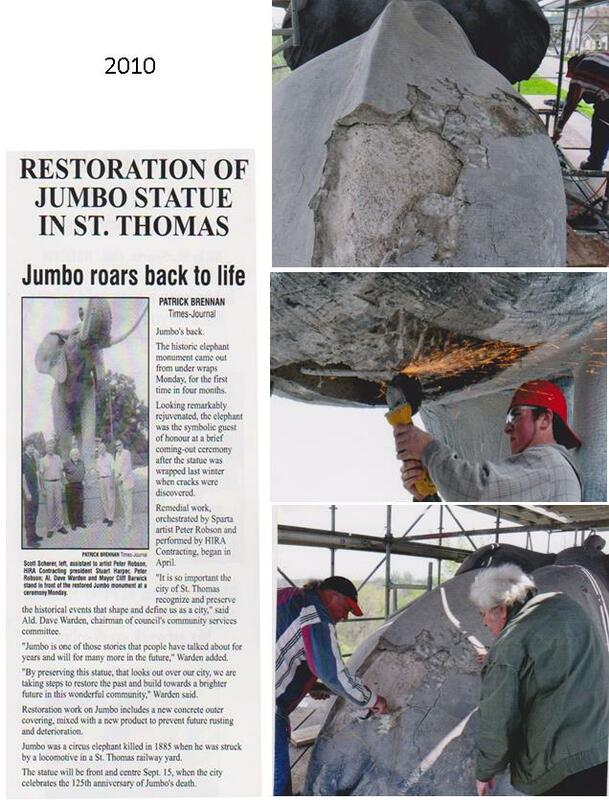 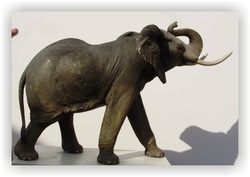 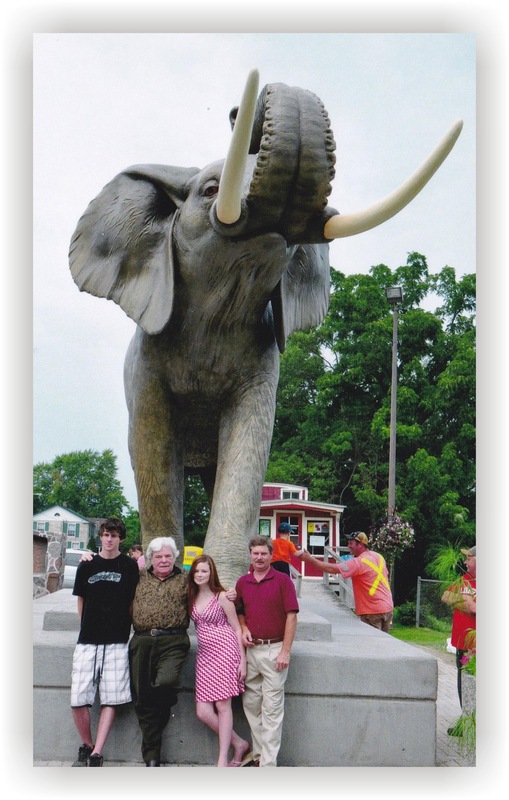 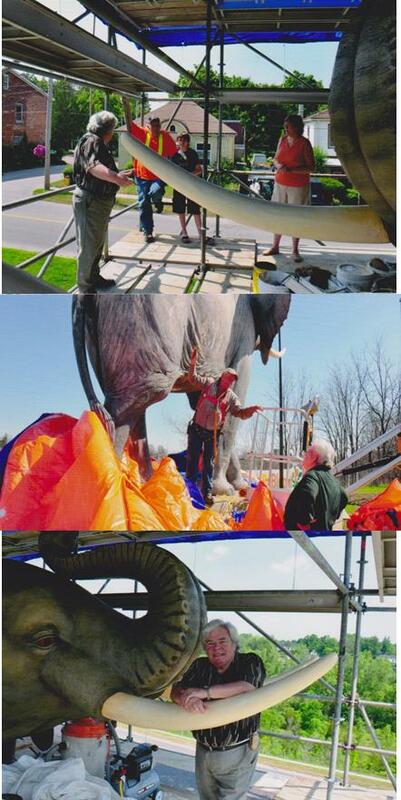 In 2010, PETER ROBSON was commissioned to restore the exterior of the famous JUMBO statue in St. Thomas, Ont. 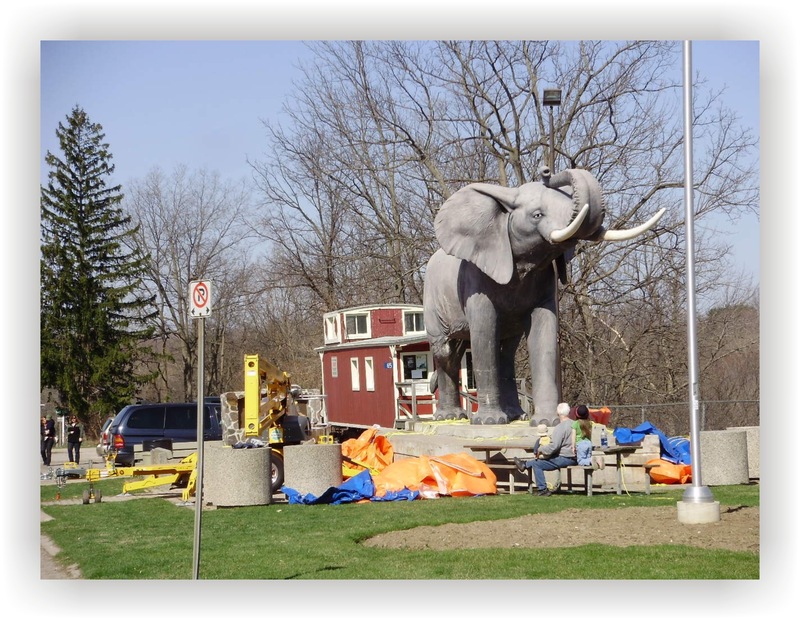 Jumbo was a circus elephant killed in 1885 when he was struck by a locomotive in a St. Thomas railway yard. 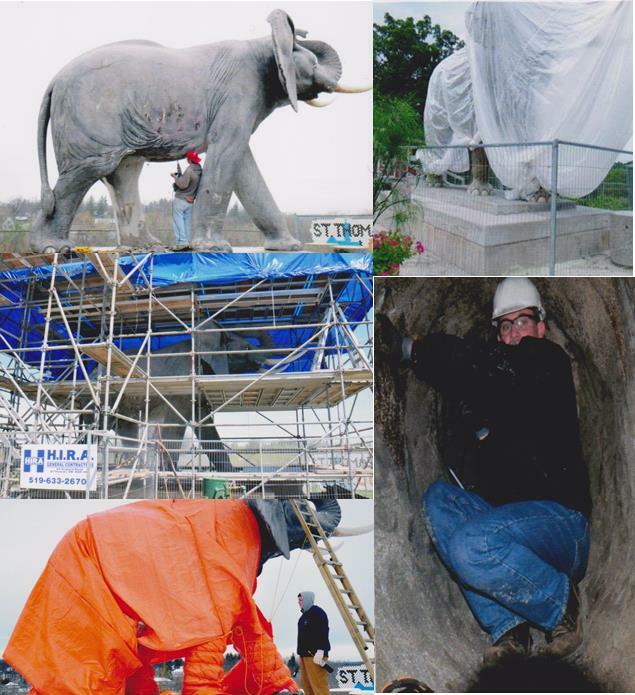 Dave Warden said, "By preserving this statue, that looks out over our city, we are taking steps to restore the past and build towards a brighter future". 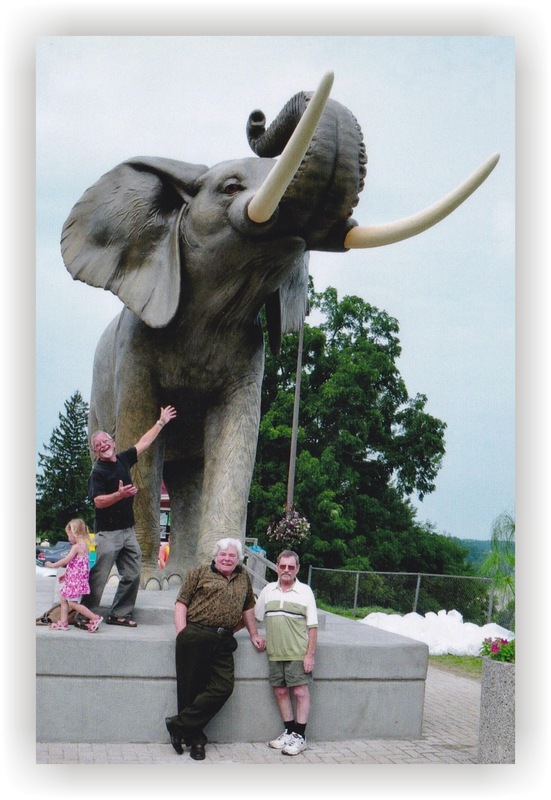 The statue was unveiled on Sept. 15th, 2010, when the City celebrated the 125th anniversary of Jumbo's death. 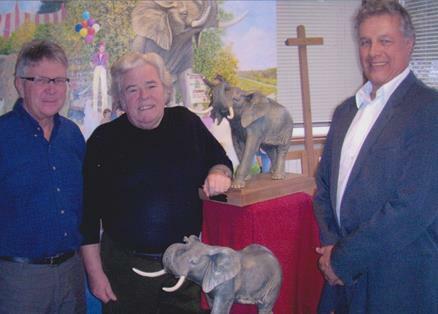 Presentation of Jumbo sculpture to Stu Harper of HIRA limited. The in progress painting of Jumbo is seen in the background. 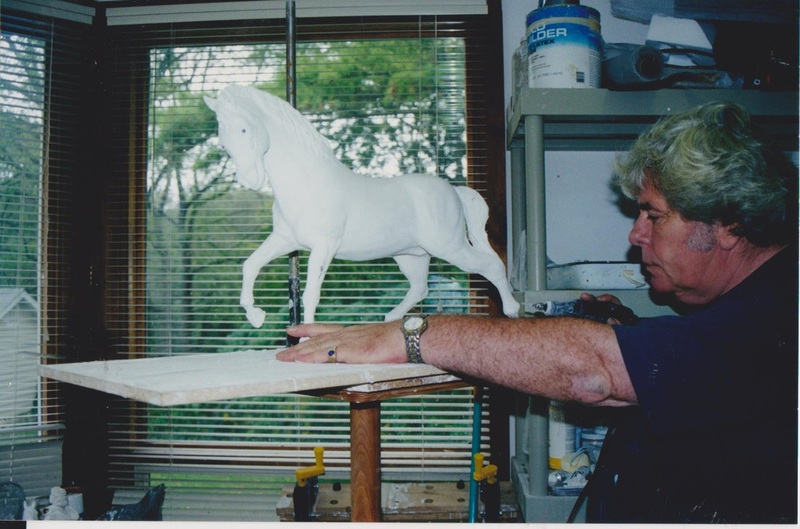 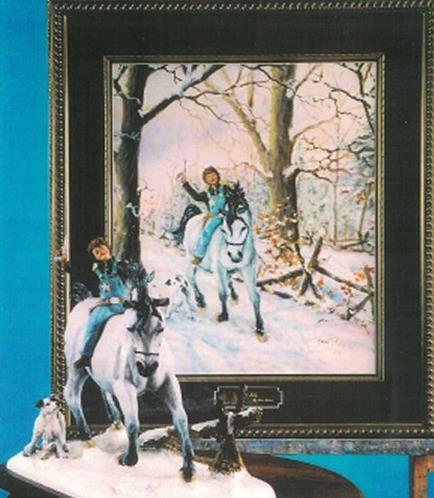 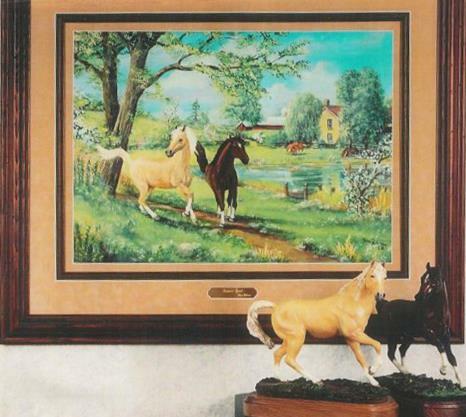 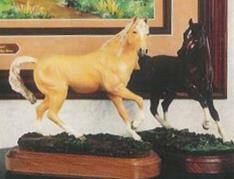 This was commissioned as a sculpture and an accompanying painting. 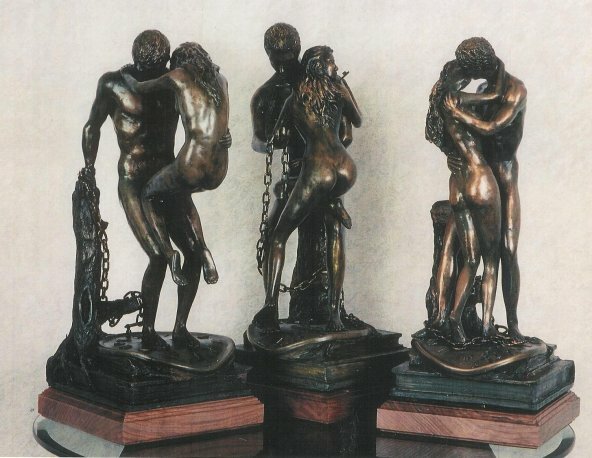 This is a series of 3 sculptures crafted in cold cast bronze. 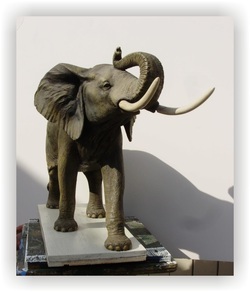 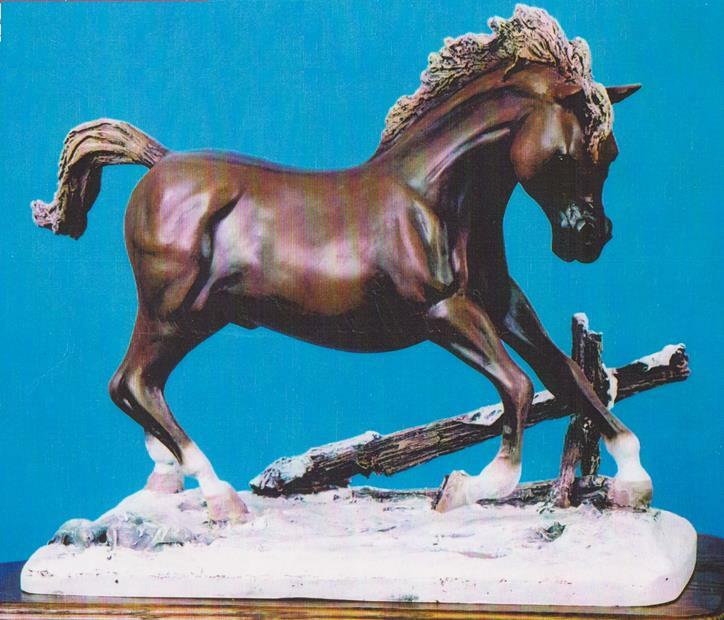 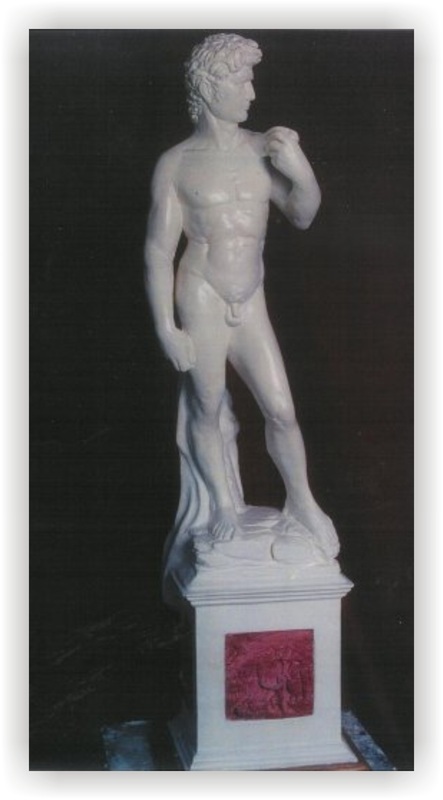 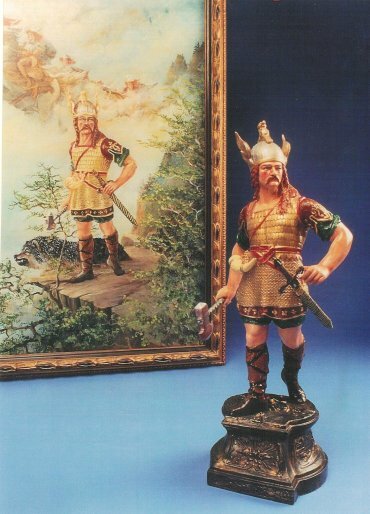 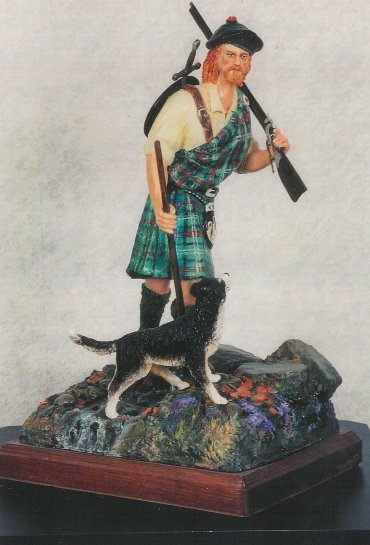 This sculpture resides in the private collection of one of Peter's large collectors. 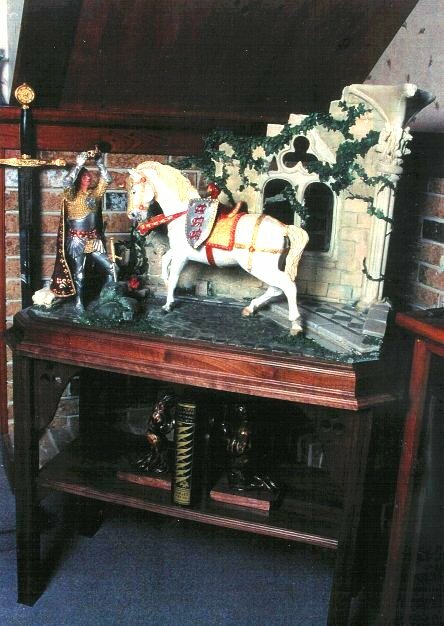 To the right is a view of the "total" piece which includes a customized table with a pair of bookends also carved by Peter. 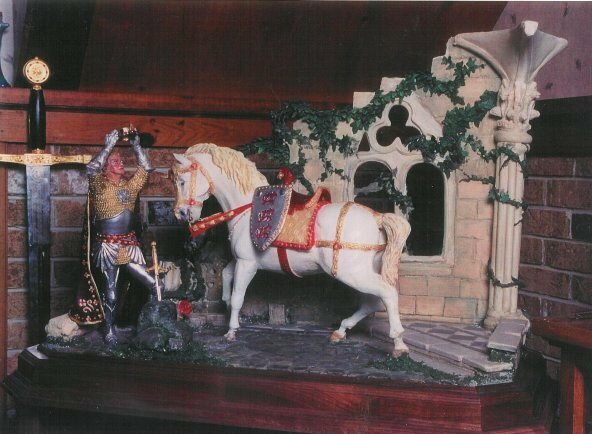 These bookends are sculptures of Lancelot and Guinevere. 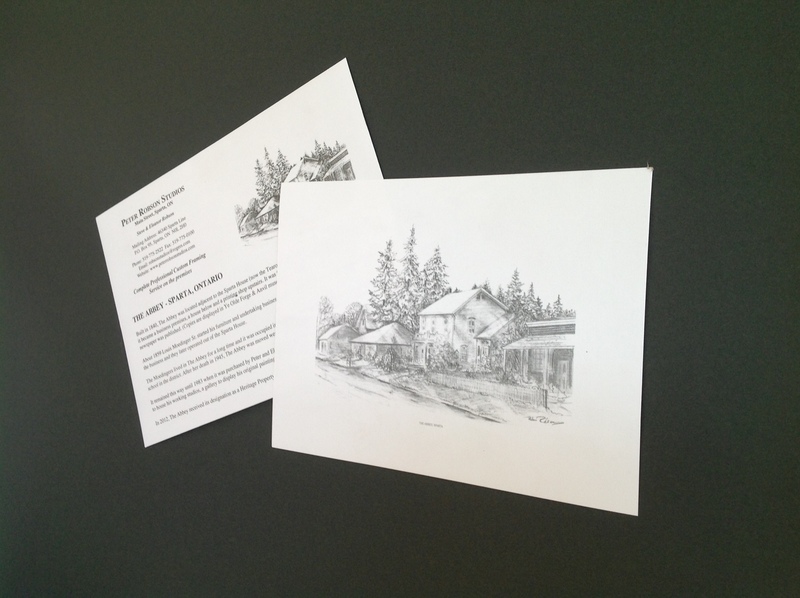 Open edition print - image size 10" x 7"